The Premier League champions are understood to be considering suing the rebel striker for up to £50million if he continues to refuse to return to the club. They would claim breach of a contract from which Costa is paid £185,000 a week – the club’s second highest earner – and which still has two years to run. Costa, who has been named in Chelsea’s 25-man Premier League squad but not in their Champions League one, is now also understood to be consulting his lawyers. The Brazilian born star’s bitter battle with Chelsea and coach Antonio Conte turned distinctly uglier last night after he failed to get the move to Atletico Madrid he wanted when the Spanish transfer window closed yesterday. Chelsea insist he remains their player and must return to fulfil his contractual obligations. Costa claims that went out of the window when Conte told him by text that he was no longer in his plans. With Costa holed up in Rio de Janeiro for the last two months the international war of words that has ensued now looks increasingly like being continued In the High Court if neither side backs down. Chelsea owner Roman Abramovich has indicated that the club won’t do that despite being forced to pay £5m to club doctor Eva Carneiro the last time they turned to the law following her spat with former manager Jose Mourinho. A defiant Costa, for whom Chelsea paid £32m in 2014, continued to send out similar signals last night. The only obvious non legal – and cheapest – way for any compromise to be reached would appear to be with Costa returning to England and resuming training with Chelsea, even though it would almost certainly be with the reserves. 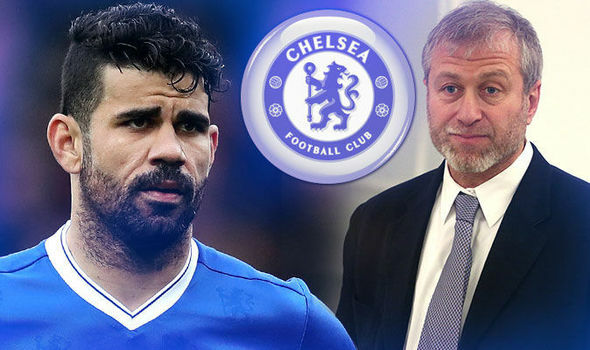 The bust-up, which threatens worldwide implications if the maverick hit man was to succeed in effectively ripping up an apparently legally binding contract, comes at a time when Chelsea face another crisis over their failure to sign key target players this summer. Romelu Lukaku, Alex Oxlade-Chamberlain, and Ross Barkley have all declined to join the club, and pressure is now increasing on directors Marina Granovskaia and Michael Emenalo who share the responsibility for recruitment. Conte, who takes no part in the legal process of signing players, has been particularly frustrated at those rejections and, along with Abramovich, wants to know what went wrong. Fans have also expressed outrage on social media, despite the big name signings of Alvaro Morata, Tiemoue Bakayoko, Antonio Rudiger and Willy Caballero, along with the deadline day captures of Davide Zappacosta and Danny Drinkwater.